The Program offers the opportunity for students attending a technical trade school, college or university to expand their knowledge-base. JAA offers internship opportunities for students in various disciplines. Time spent by an intern will be to support and assist the Authority in the accomplishments of its core objectives and operational duties. Interns will participate in a program structured to provide challenging assignments and “real-world” projects with responsibilities while building knowledge and fostering professional growth. 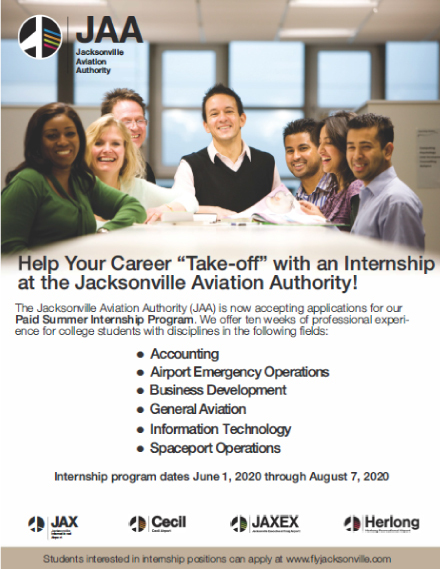 The Jacksonville Aviation Authority’s Internship Program is a fast-paced, high-level program that introduces students to the aviation industry. Participation in the JAA’s Internship Program does not guarantee an offer of employment.